What Does Maintenance Do For My Tankless Water Heater? 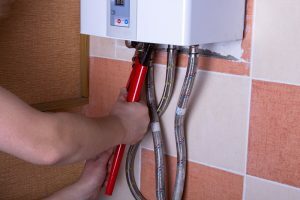 In many ways, tankless water heater maintenance isn’t that much different than maintenance for a traditional storage tank system. It receives a professional inspection, the natural gas burners are cleaned, and our technicians check for problems with leaks. Also, just like any other natural gas appliance, your tankless water heater will be inspected for potential gas leaks from the combustion chamber. Storage tank water heaters need an occasional flush, but tankless systems should actually be flushed once a year, during maintenance. This helps to remove mineral buildup inside the unit. Even the smallest amount of mineral deposits in a tankless system can block water from moving through the unit, and result in a drop in water pressure. One of the most important parts of maintenance is finding areas where repairs need to be done in order to prevent bigger repairs later on. Your tankless water heater might seem to be running “just fine,” but can still be developing problems. For instances, a small water leak inside the tankless system will lead to the worst problem you can have—corrosion. Water traveling across the burners can and will cause rust and efficiency issues. If corrosion escalates enough, your entire tankless water heater will need replacement. But proper inspections will catch trouble like this early on so it can hopefully be repaired before you have a more serious problem on your hands. There are some systems in your home that require maintenance during a certain time of the year. Take your air conditioner for instance—it would be pretty inconvenient to shut it off for a couple hours on one of the hottest days of the year for maintenance to be done. That’s why AC maintenance is typically done in the spring—or late winter sometimes in our climate! Water heater maintenance, however, can literally be done any time of the year, so there is no reason to delay! It matters a lot more that you have this service done regularly, once a year, than it does it be any certain time of the year. We want you to have exceptional performance from your tankless water heater, so be sure to contact us today to schedule your next tune-up. Call the super friendly team at Admiral Plumbing Services, LLC for exceptional service!